NEW for 2014, the Handy Home Products Briarwood 10 ft. x 8 ft. Do-It-Yourself Wood Shed Kit exudes a country attitude, wrapped in a timeless design; sure to add style and sophistication to your backyard. The Briarwood starts off right, with generous, 4.5 in. deep roof overhangs and TWO gable vents. The ideal-sized, 48 in. wide x 6 ft. high double doors with full-length hinges, provide easy access for all your tools of the trade. A clean, open floor plan gives way to 708 cu. ft. storage capacity with 6 ft. 4 in. high side walls and a 10 ft. 2 in. high peak. The smart and strong 2x4 wood interior can be customized the way you want it. A premium, keyed locking T-handle is included for added security. Add optional accessories to make it the perfect storage shed, hobby/craft area and more! This Do-It-Yourself wood shed kit can be easily assembled with a hammer, screwdriver, tape measure, level and stepladder. To purchase with floor, please see MFG Model # : 19352-1. Optional accessories shown sold separately. The Duramax Apex Vinyl Shed is produced from the highest quality vinyl resin and unlike polyethylene is fire retardant and is guaranteed for 15 years from product defects. The interior heavy duty galvanized steel beams,columns and trusses gives this shed unmatched strength and longevity. The outer walls of superior fire retardant resin provides additional safety when storing gas,gas grills, paint, propane and other flammable products. Your Apex Vinyl Shed won't rust, rot, dent or need painting and is impervious to wood eating insects. The Apex roof design and eye catching attractive colour combination blends with any home. The shed is lockable, lock not included for safety and has a galvanized steel foundation. The high heavy duty double doors makes it easy to enter and store items. The doors when open reveals extra large storage capacity. All the parts are packed neatly into the carton and the shed has easy to read and follow assembly instructions. Contemporary gable style storage building accommodates just about any backyard. Offers more cubic feet and a generous door opening with easy access for those larger items organize your stuff or create and customize the ultimate workshop! The Princeton's strong 2x3 framing accommodates a variety of readily available hooks, hangers, shelving and other organizational products you can purchase at The Home Depot. Actual foundation size: 10w x 98-5/8d. Get organized and life gets easier. A Lifetime shed can help. Keep all your lawn and garden equipment in one convenient place, in one convenient location your yard. Shelving and peg strips are included so you can keep your smaller tools and supplies right at your fingertips. 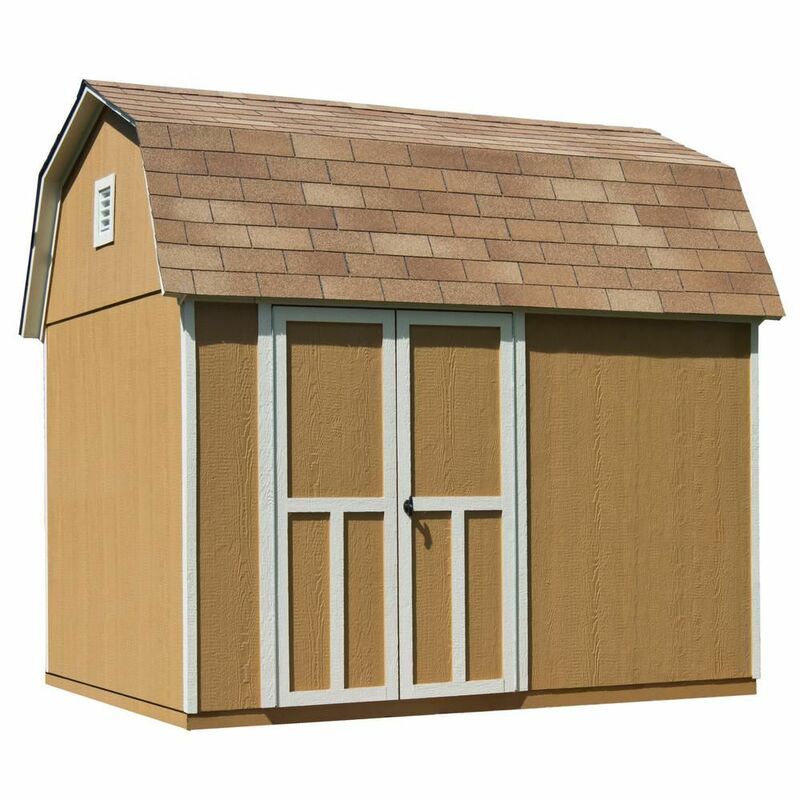 This Lifetime shed is constructed from high-density polyethylene (HDPE) plastic with steel reinforcements for durable quality and low-maintenance style. No painting, no rusting, no splintering. Lifetime sheds are UV-protected to provide weather resistance against fading and cracking. Looks great when you get it. Looks great for as long as you own it. Do yourself a favour and get your lawn and garden equipment organized with this worry-free shed from Lifetime. This shed must be built on a flat level foundation of wood or concrete (not included). 10 ft. x 8 ft. Briarwood Shed NEW for 2014, the Handy Home Products Briarwood 10 ft. x 8 ft. Do-It-Yourself Wood Shed Kit exudes a country attitude, wrapped in a timeless design; sure to add style and sophistication to your backyard. The Briarwood starts off right, with generous, 4.5 in. deep roof overhangs and TWO gable vents. The ideal-sized, 48 in. wide x 6 ft. high double doors with full-length hinges, provide easy access for all your tools of the trade. A clean, open floor plan gives way to 708 cu. ft. storage capacity with 6 ft. 4 in. high side walls and a 10 ft. 2 in. high peak. The smart and strong 2x4 wood interior can be customized the way you want it. A premium, keyed locking T-handle is included for added security. Add optional accessories to make it the perfect storage shed, hobby/craft area and more! This Do-It-Yourself wood shed kit can be easily assembled with a hammer, screwdriver, tape measure, level and stepladder. To purchase with floor, please see MFG Model # : 19352-1. Optional accessories shown sold separately.